Michael Conlan celebrates his third consecutive St. Patrick’s Day in the ring, as he faces Ruben Garcia Hernandez in an ESPN-televised featherweight bout Sunday evening at Madison Square Garden’s Hulu Theatre in New York City. The venue served as the home for the 2017 pro debut of Conlan (10-0, 6KOs), a two-time Olympian for Ireland who captured a Bronze medal in the 2012 London Games. The now 27-year old from Belfast, Northern Ireland returned rang in St. Patrick’s Day with a 3rd round knockout to kick off his pro journey, returning here one year ago with a 2nd round knockout victory. Sunday’s bout marks his fifth overall on MSG grounds. 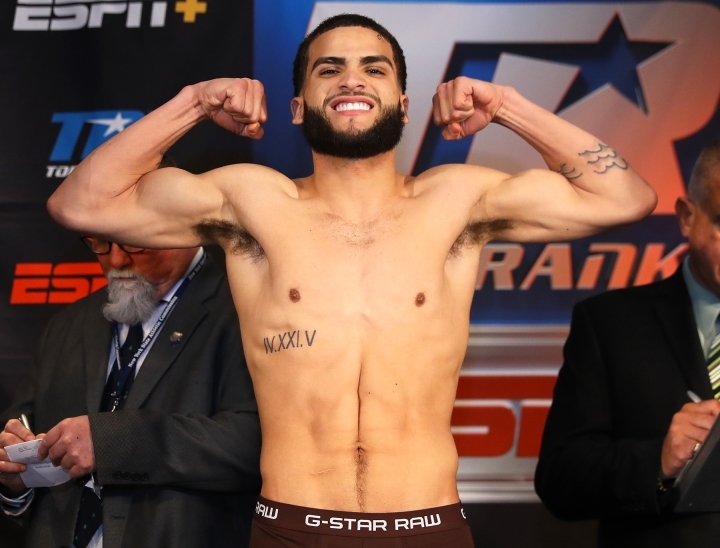 Josue Vargas continues to grow in the pro ranks, perhaps no more so than in between rounds during his unanimous decision win over Adriano Ramirez (10-3, 6KOs) in their eight-round super lightweight bout. Scores of 80-72 across the board all landed in favor of the Bronx-based Vargas (13-1, 8KOs), whose desire to play to the crowd eventually gave way to his corner’s insistence to remain disciplined. An entertaining, if one-sided affair saw Vargas healthily mix boxing and trading, the latter in his best efforts to satisfy his adoring supporters seated ringside. It saw the 20-year old take unnecessary chances in the later rounds, although attributed to his desire to keep alive a four-fight knockout streak he carried into the bout. Vargas’ actions resulted in an earful from his father and head trainer, urging his son—dubbed “The Prodigy” for his brilliant amateur run—to regain his focus and concentrate more on the win itself than the manner in which it’s obtained. The student obliged, boxing smartly in the eighth and final round to secure his seventh consecutive win. The lone blemish on his record came in an Oct. ’16 disqualification loss to Samuel Santana, a fight in which Vargas hitting his foe while back turned and in retreat. He’s been perfect every night since, although Sunday’s bout marked his first since June ’17 in which he was forced to hear the scorecards. John Bauza remained perfect with a six-round decision win over Ricardo Maldonado in a bout that probably didn’t have any business going the distance. Scores were 60-54 across the board for Bauza (12-0, 5KOs), a 20-year old from just across the Hudson River in North Bergen, New Jersey by way of Rio Piedras, Puerto Rico. The traffic was all one way, to the point of Maldonado (8-9-1, 1KOs) suffering an unnecessary battering down the stretch. A hard conversation took place in his corner whether to allow Washington state journeyman to come out for the 6th and final round. He was so permitted, with Bauza putting an exclamation point on a terrific performance. Russia’s Vladimir Nikitin kept his unbeaten record intact, along with long-term plans for a collision with 2016 Rio Olympics rival Michael Conlan with a hard-fought six-round decision over Juan Tapia in their ESPN+ preliminary bout Sunday afternoon at Madison Square Garden’s Hulu Theatre in New York City. Judge Alan Rubenstein’s score of 57-57 was overruled by matching cards of 59-55 from Mark Consentino and Kevin Morgan in favor of Nikitin, a 2016 Olympic Bronze medalist. Though just three fights into his pro career, it’s clear that punching power is lacking in the repertoire of the rookie featherweight, who turns 23 later this week. Nikitin doesn’t shy away from fighting in the trenches, but his lack of an equalizer played into the hands of Tapia (8-3, 3KOs), a durable Texan who’s never been dropped or stopped. A rough and tumble affair saw Nikitin gain the upper hand in a free-swinging 4th round, when he had Tapia in trouble while pinned along the ropes. It never threatened to result in a stoppage, but showed the rising prospect’s determination in grinding out the win. Nikitin (3-0, 0KOs) remains best known for his controversial win over Conlan (who fights later this evening on the ESPN-televised portion of the card) in the 2016 Rio Olympics. The win helped propel Nikitin into the medal round, while Conlan’s reaction—a pair of middle fingers for the judges and an epic rant speaking to the game’s corruption—remains a permanent part of his boxing career. The damage sustained in the bout, however, prevented Nikitin from fighting in the semifinals versus Shakur Stevenson, a 2016 Olympic Silver medalist who shut out Tapia last February. Nikitin remained in the amateurs until signging with manager Egis Klimas and turning pro last July. He signed with Top Rank, who also has Conlan and Stevenson and has been fairly open with its intentions of a Conlan-Nikitin sequel down the road. Ireland’s Lee Reeves (3-0, 2KOs) celebrated St. Patrick’s Day with a four-round decision over Edward Torres in their super lightweight heat. Scores were 40-36 across the board for the Limerick southpaw, who was forced to go the distance for the first time as a pro. Joseph Adorno (12-0, 10KOs) endured a stiff challenge from Mexico’s Victor Rosas (10-9) in taking a six-round unanimous decision. Scores were 58-54 across the board for Adorno, a rising super featherweight prospect from Allentown, Pennsylvania.